Colds, chickenpox, and even yawns are contagious. But are dental cavities? 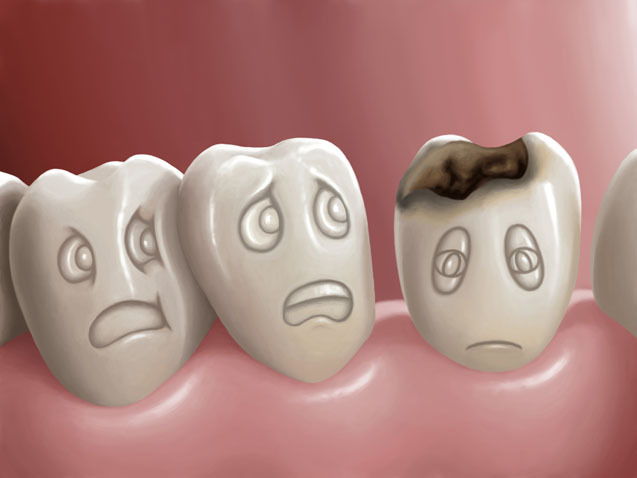 Cavities are caused by an acid by-product of bacteria . Bacteria feed on food substrate present in the mouth. The mixture of acid, food, saliva and bacteria is known as plaque and lies on the tooth surface. Bacteria thrive in this environment producing acid, causing decay. One study in the Australian Dental Journal pegged tooth decay as one of the most common infectious oral diseases. Researchers found that 30 percent of 3-month-olds, 60 percent of 6-month-olds, and nearly 80 percent of 2-year-olds were infected with cavity-causing Streptococcus mutans bacteria, a strain that’s especially likely to cause cavities. These bacteria can spread from mouth to mouth via shared food and utensils, sneezing, kissing, and more. Children aren’t born with S. Mutans. But studies show that most of them “catch” it from their caregivers — often, their parents. By the time they are two years old, over 80 percent of kids will have detectable levels of the bacteria. Bacteria need the food substrate available to produce the acid causing decay. So even if the bacteria is present it’s your job to reduce frequency of sugar intake, and to increase the frequency of food substrate removal from the teeth to limit the cavity producing toxins being formed. SO: All in All: We can pass on from person to person the acid producing bacteria that is involved in cavity formation but most of us by a young age already have the bacteria present. Contrary to popular belief cavities can not spread from tooth to tooth! Although if you aren’t clearing the plaque away thoroughly and have a high sugar diet the chance of cavities rises for all teeth that are exposed to these conditions. 1: Drink lots of water: Washes away plaque, food and bacteria. 2: Chew sugar free chewing gum between meals to increases beneficial saliva to combat bacteria. 3: Good oral hygiene including brushing twice a day and flossing to manually remove plaque. 4: Regular dental checks to make sure there are no early cavities starting. **Fluoride can reverse very early cavities so always use a fluoridated mouth wash if possible.